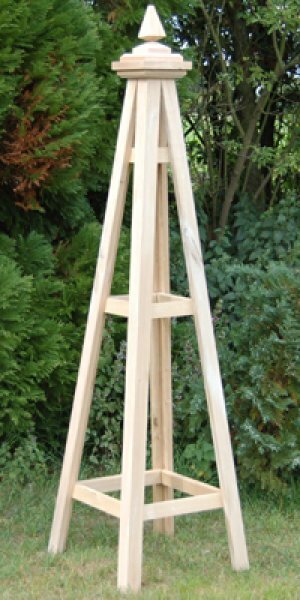 Add dramatic support to your climbing garden plants with the Hodnet Wooden Garden Obelisk.The Hodnet obelisk adds stability and control to climbing plants. 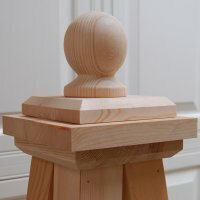 This hand crafted obelisk make perfect supports for roses and clematis. It also adds height to your herbaceous borders. The Hodnet Obelisk will enhance any garden, both formal or informal, and provide interest all year round whether covered with flowers in summer or sparkling with frost in the winter. Make your garden the envy of your neighbours by adding garden obelisks to grow vines of flowers, or fruit, and garden vegetables up. A garden obelisk will add an extra dimension to your garden, giving height to an otherwise flat flower or vegetable bed, and vegetables growing up a garden obelisk look very attractive as well as taking up far less space than when left to grow sprawling along the ground. are 'Peggy Martin', 'Climbing Iceberg', 'Red Cascade' and 'Cl. Cramoisi superieur'. Carolina jasmine, (Gelsemium sempervirens), cross vine (Bignonia capreolata) or Confederate jasmine (Trachelospermum jasminoides) are especially good choices since they are evergreen.If you prefer to grow vines, a mandevilla (Mandevilla x amoena 'Alice du Pont') is a popular choice for summer colour in the garden. They bloom from spring till frost but require winter protection. Do not forget that even small garden obelisks need to be firmly set into the ground to prevent them blowing over, and keep in mind that wind resistance is much greater when the obelisk is covered with plants.